AUGUSTA, Ga. – What happens to a dream deferred? On an historic afternoon on an iconic course, it can turn into a dream showdown. Jennifer Kupcho and Maria Fassi – the only two players in the inaugural Augusta National Women’s Amateur field to have deferred their LPGA Tour qualification until after their senior seasons in college – dueled head-to-head in the final pairing at Augusta National Golf Club on Saturday to provide an unforgettable exclamation point to a ground-breaking week for women’s golf. Kupcho, the top-ranked amateur in the world, endured a migraine headache that corrupted her vision for three holes and yielded her wire-to-wire lead before catching fire on the famous second nine with an eagle and two birdies in a four-hole stretch that took her from two down to two up. 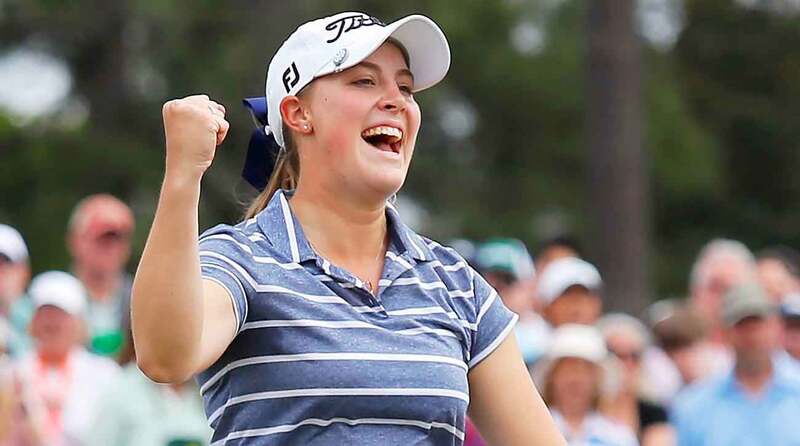 She buried a 30-foot birdie putt on the last hole to elicit an appreciative roar from the patrons and become the first female champion at Augusta National. Kupcho, a Wake Forest senior, shot 5-under 67 in the final round to finish 10-under, four shots ahead of Mexico’s Fassi, a senior at Arkansas. Yuka Saso of the Philippines and Yuka Yasuda of Japan tied for third at two under while 16-year-old Zoe Campos and Kaitlyn Papp tied for fifth at one under. Tied with Fassi after seven holes, Kupcho developed a migraine on the eighth that left everything on the left side of her vision blurry. It was a problem she largely hadn’t dealt with since high school. She couldn’t see the lines of her putt when she looked at the ball and three-putted the 10th hole to fall two shots behind. The blurriness lifted in the 11th fairway and she went into catch-up mode. With 211 yards to the hole on the par-5 13th hole, Kupcho delivered a laser-like 3-hybrid to six feet and drained the eagle putt to erase her two-shot deficit. Fassi, however, answered with a birdie on 14 to go back on top. Kupcho again gave herself an eagle chance at 15 while Fassi had to lay up after missing the fairway. Kupcho’s putt from just off the back edge nestled to two inches for another birdie to square what had all day been a two-player match. The decisive moment came on the 16th hole, where Kupcho rolled in a six-foot birdie putt and Fassi three-putted from the top right of the green for a tie-breaking two-shot swing. Fassi, the most powerful player in the field, was the aggressor early, overcoming a bogey on the opening hole to make birdies on 2, 3, 7 and 8 to track down Kupcho and take the lead before her friendly rival battled back with her pin-seeking on the par 5s. Kupcho gave no inch down the stretch. Fassi could only applaud her friend as they walked up the 18th hole surrounded by patrons. Fassi gave Kupcho a long embrace and whispered how proud she was of her performance. Kupcho believed the two players who deferred turning professional set the proper tone for an event designed to inspire young women to play golf. The day provided everything anyone could have hoped for as a showcase for the women’s game on the iconic host venue for the Masters Tournament. It had all the trappings of the major championship that will start on the same tee in five days. Club chairman Fred Ridley, who announced the creation of the event a year ago, welcome four Hall of Famers to officially open the event as honorary starters. Se Ri Pak, Lorena Ochoa, Nancy Lopez and Annika Sorenstam each hit drives right down the middle of the fairway under the watchful gaze of thousands of patrons and dozens of green jackets, including two-time Masters champion Bubba Watson. Then nobody moved as University of Virginia senior Anna Redding nervously stepped to the tee at 8 a.m. to hit the first shot in competition by a woman in the 85-year history of the club. A crowd presumed to be about two-thirds the size of a regular Masters gallery, created a unique atmosphere for mostly collegiate players unaccustomed to so much attention. The experience left Redding, and many other young women in the field, emotional. Redding was disappointed in her 76 and tie for 26th, but thrilled for being part of something significant in women’s golf.